The BBC reported record-breaking online stats on Saturday thanks to high audience figures for the royal wedding and FA Cup final. The BBC said that Saturday was “the biggest ever day for BBC Online” with audiences consuming 11.9 petabytes (11.9 million gigabytes) of data, peaking at 2.8 terabits per second when people got their first glimpse of Meghan Markle’s dress. Prior to that, the largest peak of BBC Online traffic was on Jan 2, 2018 with audiences consuming 10.2 petabytes and with peak traffic reaching 2.6 terabits per-second. A BBC spokeseperson told DTVE that this wasn’t driven by a major sporting or national live event like the wedding, but by strong performances that day for BBC series EastEnders and McMafia. The royal wedding was also the second most-popular live event ever on the BBC iPlayer with 1.9 million live requests, according to BBC data. The largest ever live event on the iPlayer was the England vs. Wales Euro 2016 football match, which attracted 2.05 million requests. On TV, the BBC logged an average audience size of 8.7 million people for the royal wedding and a peak audience rating of 13.1 million. 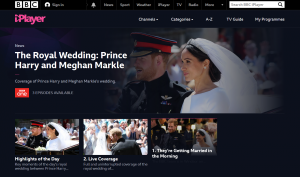 Separately, content delivery network (CDN) Limelight Networks monitored the online traffic spikes experienced during the royal wedding by its customers, which include the BBC, Sky and Channel 4. Limelight recorded an average increase of 225% in viewership during the wedding, with the UK seeing a 119% increase in viewers and the US a 343% increase. The three biggest peaks in traffic included, in order of total viewership: the first appearance of the bride; the bride and groom’s first kiss; and the beginning of the formal procession. 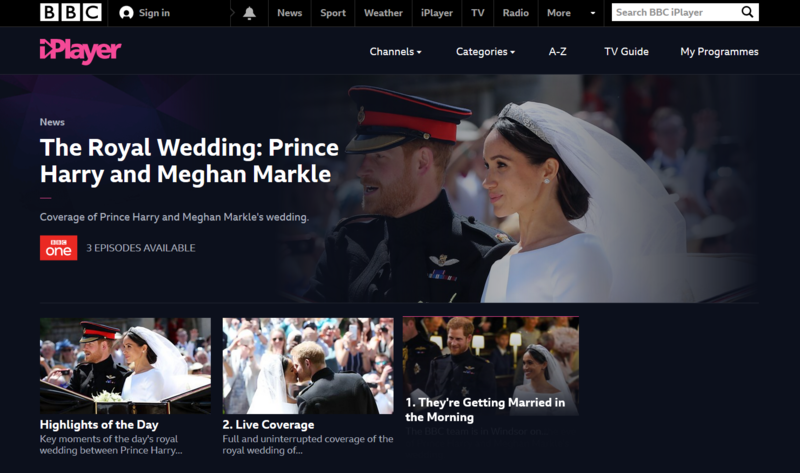 “The royal wedding demonstrates the growing pressures high-profile events can put on a broadcaster’s network,” said Jon Smith, managing director of EMEA at Limelight Networks. Nielsen reported that an estimated 29.2 million US TV viewers tuned into Prince Harry and Meghan Markle’s wedding, which was carried live by 15 networks – including ABC, BBC America, CBS, CNN, Fox News, MSNBC, NBC, PBS, Telemundo and Univision.